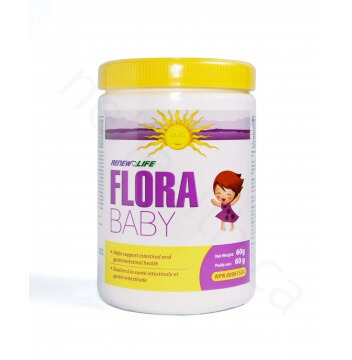 FloraBABY is a blend of probiotics (good bacteria) that is specifically formulated for the intestinal tract and colon of children. 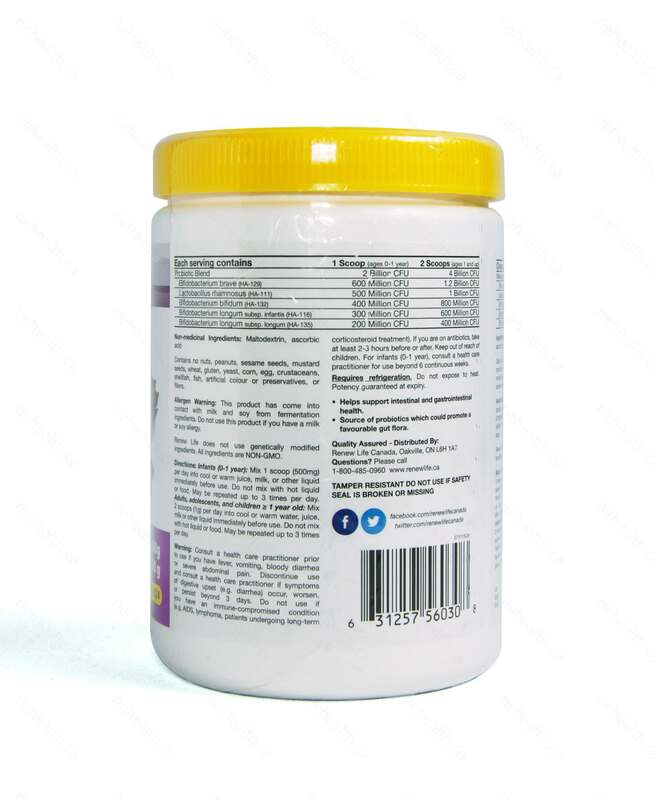 It is a flavourless powder which can easily be mixed into warm or cool drinks such as infant formula, water, juice and milk, or soft foods such as yogurt and apple sauce. This allows parents to provide probiotics to children who do not like or have a difficult time taking supplements. Please note that it should not be mixed with hot liquids or hot foods. 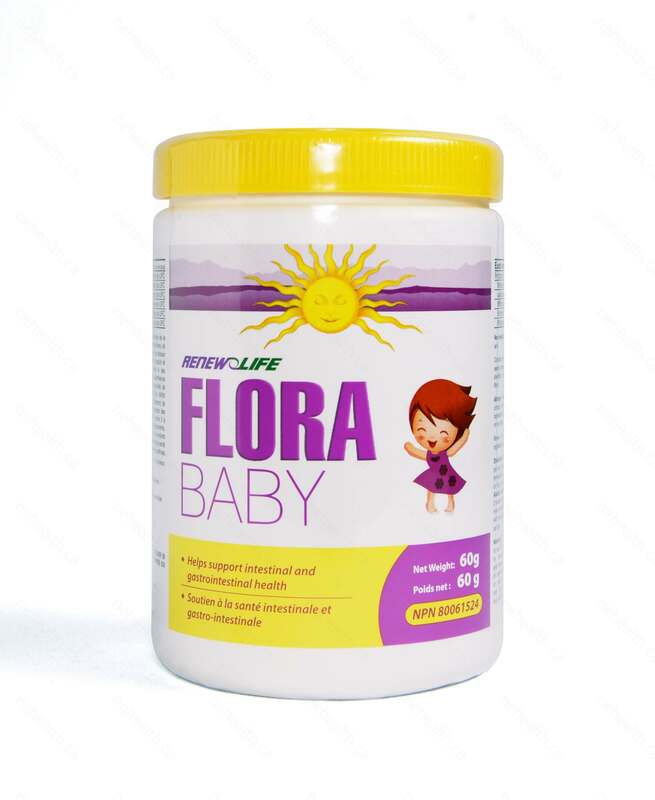 FloraBABY is a blend of 5 strains of probiotics normally found in children: Bifidobacterium Breve, Lactobacillus Rhamnosus, Bifidobacterium Bifidum, Bifidobacterium Infantis and Bifidobacterium Longum. These 5 probiotics work synergistically to help ensure a healthy microbacterial environment in the intestinal tract of children. The term ‘probiotic’ means supporting life. Probiotics are friendly, beneficial bacteria. These bacteria are normal inhabitants of the large and small intestines and are an important part of a healthy digestive system. Recent research shows that probiotics help improve gastrointestinal function, respiratory and allergy response, as well as help to counter the negative effects of antibiotic use. Further, these beneficial bacteria help the body to produce vitamins, absorb nutrients, and control overgrowth of bad bacteria and fungus. Why should children use FloraBABY? FloraBABY can be taken daily as a preventative measure against invading bacteria and to ensure intestinal development and good health. Ideally, removing what causes the destruction of beneficial bacteria would be ideal (stress, antibiotics, etc.). However, there are times when these medications are required and stress is often inevitable. FloraBABY can be used to replace the beneficial bacteria that is lost during these times. Whenever a child needs to take antibiotics, FloraBABY should be taken for one month afterward to replenish the good bacteria. Contains no nuts, peanuts, sesame seeds, mustard seeds, wheat, gluten, yeast, corn, egg, crustaceans, shellfish, fish, artificial colour or preservatives, or fillers. Renew Life does not use genetically modified ingredients. All ingredients are NON-GMO. Infants (0-1 year): Mix 1 scoop (500mg) per day into cool or warm juice, milk, or other liquid immediately before use. Do not mix with hot liquid or food. May be repeated up to 3 times per day. Adults, adolescents and children ≥ 1 year old: Mix 2 scoops (1g) per day into cool or warm water, juice, milk or other liquid immediately before use. Do not mix with hot liquid or food. May be repeated up to 3 times per day.